It has been shown that, at least in certain languages, tense is represented in nominals (Lecarme, 1996, 2004). It is therefore important to consider whether the interplay between tense and modality which is commonly found in clauses exists in the nominal domain as well. This article investigates the non-temporal meanings of nominal tenses in Somali, an Afroasiatic language. 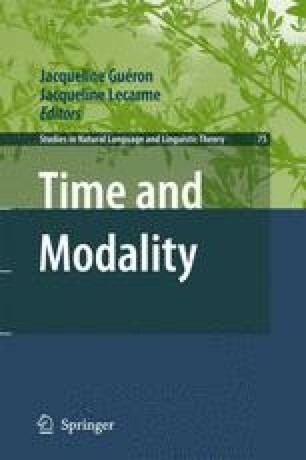 It explores the conditions under which nominal past morphology is interpreted in the modal dimension, contributing either a quantificational reading of the past DP (comparable to English -ever in e.g., ‘whenever’) or an evidential reading focusing on the visible / non-visible distinction. It is argued that the common abstract feature underlying the various meanings of past morphology in nominals is a more primitive feature of “exclusion/dissociation” (Iatridou, 2000). To account for the link between direct evidentiality and visual perception in nominals, it is proposed to extend Kratzer’s (1981, 1991) theory of ‘doubly relative’ modality to include a perceptual component. In this revised framework, past morphology gives rise to ‘non-actual’, ‘unknown’ or ‘invisible’ modal meanings, depending on different choices of modal base and ordering source.